1. What cars can I do a 3L swap into? ONLY V6 2.5L (1998+ Contours and Cougars), any transmission works fine. 4 Cylinder cars require more modification than it’s worth. It’s much cheaper and easier to sell the 4 cylinder car and buy a V6 car. The early 1995-1997 2.5L Contours have a few differences than the later year Contour/Cougars which may complicate things. I know a 3L swap can be done into those year cars but we have not swapped one yet as most interest is for the later year cars. We will continue looking into this and if you have questions on a 3L for a 1995-1997 2.5L Contour email us. 2. How long does it take to do a motor build? Generally we have engines in stock ready to go meaning they would be shipped out within a few days. If we have to build a 3L it normally takes about a week to build up and ship out. Shipping is normally 3-5 days. 3. How much horsepower/torque with a 3L swap give me over the stock 2.5L? Usually it nets between 30-60hp and 30-50torque, depending on intake and exhaust modifications in the car. With a custom tune, more horsepower and torque is typical. A stock 2.5L Cougar (manual) dynos around 145whp and 140wtq. A stock 2.5L SVT Contour dynos around 165whp and 160wtq. A 3L Cougar/Contour will dyno around 190-220whp and 195-205wtq (+75whp and 65wtq on a fully modded/tuned Cougar). Even for the SVT Contour the 3L swap is a significant improvement. The difference is night and day. You’ll wonder why Ford didn’t install 3L’s into these cars originally. Click HERE for more horsepower/dyno information. Email us if you have questions or want more dyno information. 4. What modifications are available for the 3L engine and are my 2.5L modifications transferable? Most modifications that fit on the 2.5L for example: headers, y pipe, exhaust, spark plug wires, pulleys, flywheel, clutch, etc. will all directly transfer over to the 3L. Some will need a larger silicon coupler for the 3L throttle body (larger than stock 2.5L throttle body but the same size as the SVT's). Almost every mod on a 2.5L other than engine internals would be transferable. 5. How hard is this 3L swap to install? If you have basic mechanic skills and tools, typical installation time for a beginner is about 10-12 hours once the stock motor is out. Our 3L’s are modified so that all of the 2.5L parts bolt directly up without any modifications. If you can install a stock motor then you can install one of our 3L’s. 6. If I bring to a shop or look for parts, what would I tell them I have? 90% of the time you will tell them you have a stock 2.5L engine. All the general maintenance items are the same oil filter, oil, plugs, sensors, alternator, starter, belts, and the majority of the gaskets. The only differences would be internally if you ever needed to tear the engine down at a later date. 7. What other supporting modifications do you recommend? HEADERS, HEADERS and a set of HEADERS. Now is the time. It’s MUCH easier to install headers while the motor is out of the car, your knuckles will thank you! Other typical modifications include transmission modifications such as shift forks, shift tower, differential upgrades, intake and exhaust. Paypal, money orders, bank checks. Sorry, no credit cards yet. 9. What type of shipping do you use? Our engines are shrink wrapped, strapped to crates and shipped out via a trucking company. Typical shipping costs range from $200 - $300, depending on distance and weight. Normally the engines go to a trucking depot closest to your location where you need to pick it up with a truck. They normally have forklifts on hand that load heavy items into vehicles. Shipping anywhere in the continental US is included in our pricing. Shipping outside of the US is extra. 10. What kind of warranty do you have? Our engine builds come with a typical 30 day parts warranty. If you have an engine issue that was not caused by the installer you will need to send the engine back to our shop for inspection. We will send out a different engine if the issue was not related to install issues. We are available for tech support during and after installation via E-mail. Typical response time within 12 hours, usually MUCH quicker. 11. What are typical mileages of the engines you build? For the most part our engines come with around 30,000-40,000 miles. We try to use motors with less than 50,000 miles whenever possible. 12. What kinds of tuning do you recommend? We recommend tuning for every Cougar or non-SVT Contour if they are using our 3L. Common tuning software for Contour/Cougars is SCT or Diablo software, which your local dyno shop should have. Those with SVT Contours who install one of our 3L’s will be happy to note the 3L runs very well on the stock program so a tune isn’t necessary but there you can get slight benefits from a tune. 13. What is a typical ¼ mile time from 3L swap cars? A stock SVT Contour typically runs around a 15.2-15.5. Stock 5-speed V6 Cougars and Contours run around 16 seconds. A properly running 3L swapped car should be able to run 14's (low 14's with supporting mods). High 13’s is also possible with the correct suspension setup. 14. Do you plan on offering any tuning services? Not at this time, we leave that to the professionals, and we also recommend you dyno-tune your car in person. Do not trust mail order tunes. If you have questions on tuning please email us and we can forward you to a competent tuner. 15. How could I get my car there if I wanted you to install the motor? Depending on distance, we can work something out. Please contact us, services range from picking up cars if nearby, to shipping via a trucking company. If the car currently runs and drives, you are welcome to drive to our shop in MN. When you arrive we can drive you to and from the airport while we work on your car or help you find a hotel nearby. 17. Do you buy Contours or Cougars with damaged motors? We would be interested if they are 2.5L cars. Depending on pricing and distance, we may be able to work something out. 18. How do I avoid the core charges? 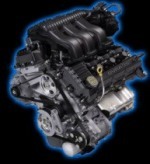 Remove the needed parts described in the Engine Price section and ship them to us for install immediately. If you need help finding the correct parts we can send pictures of each core part for reference and the basic removal technique. 19. Where can I obtain information on removing my stock engine? General workshop manuals can be obtained from any auto parts store and are nice to have for reference. You will need a Ford manual if you want a detailed step by step removal instruction. This can be found on EBay generally and in a few other places. Email for details. 20. Can I ship you my engine for the core parts? Yes, if you want to ship us your old engine we can remove all the core parts and recycle the remaining parts. 21. If I choose to have you build and install the engine for me how long does it take? Normally the swaps take a few days of nonstop work. We also like to keep the cars slightly longer to work out any bugs like pesky check engine lights or bad sensors. A safe estimate is to plan about a week. Any problems not associated with the 3L install such as bad sensors will be the owners responsibility. 22. What are secondaries and do your engines/cars use them? The stock 2.5L has secondaries in the lower intake manifold. These are butterfly valves that open up under wide open throttle after 3,400 rpms to let more air into the engine. This gives the 2.5L's more low end torque. The 3L we sell will be ported out to accept a stock 2.5L lower intake which has secondaries so if you left them in the 2.5L lower intake you will still have secondaries and it will work like normal. 23. What octane should I run in a 3L swapped car? From our experience we run 87 octane in all our 3L swapped cars UNLESS the car has been tuned for 93 octane. Even in the SVT Contours which require premium fuel from factory we still find that 87 octane works perfectly with the 3L swaps. *Note: We are not responsible if you run low octane and blow your engine from detonation. The response above is based on many 3L SVT Contour swaps and while we believe it is accurate there can be differences in gas from one place to another. 24. What gas mileage can I expect with a 3L swapped car? All of the swaps we have done seem to achieve (20/27 city/highway). Well tuned cars should achieve stock gas mileage (20/29 city/highway). 25. I have an automatic transmission does that matter? No, the 3L will bolt directly to the 5-speed manuals or the automatics without any issues. 26. Where are you located? We’re located outside of Minneapolis, MN, USA. 27. Do I need to install anything on your engine before I put it in my car? Yes, you will need to transfer over your accessories and some sensors from your old engine to the new one. These include: alternator, power steering pump, knock sensor, oil pressure sensor, and DPFE sensor. Obviously you will need to install your flywheel, clutch, transmission, starter, etc. For specific questions on this topic please email us. 28. Are the heads ported on the engines you sell? No, the heads are machined so that your 2.5L intakes will bolt directly to the heads as they would in a normal 2.5L. The heads are not polished to a mirror finish after machining. The machine work is relatively smooth if not smoother than the stock finish. Laser cut steel plates are installed on the heads to cover up the 3L injector spots and leave a nice flat surface for the 2.5L lower intake to sit on. You will need to snap off the plastic centering pins on your lower intake manifold gasket for it to sit flat on the 3L heads.